One of the newer planned communities in Carolina Forest, Waterbridge was established 2010. Offering some of the most impressive home sites, the nicest amenities, and the best curb appeal in the Myrtle Beach area, this gated subdivision is a popular choice amongst home buyers. Read more about Waterbridge real estate. Waterbridge has a resort-style ambiance with an emphasis on upscale waterfront living. 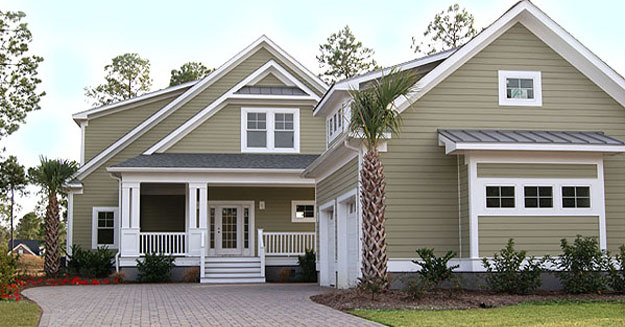 The coastal cottage-style homes have wrap-around porches with stunning lake views. Prices start at about $300,000 for these elegant homes. The amenities are worthy of a first class resort! Residents walk down streets lit by lanterns. Utilities are underground. The clubhouse offers the largest residential pool and waterpark in South Carolina. There is a 60- acre lake, gazebos with fire pits, and a fishing dock, as well as a community boat launch and dock. Residents also enjoy a fitness center, tennis courts, volleyball, and more. To appreciate this enchanting neighborhood, you really have to see it, so call our Carolina Forest experts today and schedule a private tour of the homes for sale in Waterbridge or any of the amazing Carolina Forest Communities.